OSWEGO, NY (May 8, 2018) – After a seventh month long wait, the Lighthouse Lanes Small Block Supermodified Series kicks off the northeast SBS season with its 2018 lid lifter; the long anticipated ‘May Meltdown’ 30-lapper this Saturday, May 12 at Evans Mills Speedway. Saturday night will mark the second appearance in as many years by the series at Evans Mills and the first ever series event under the lights at the Jefferson County oval. The May Meltdown will be the 24th Small Block Super show all-time at the track combined between NORA, Lighthouse Lanes SBS Series, and unsanctioned races. 16 Small Block Supermodifieds have confirmed their intent to compete with the Lighthouse Lanes SBS Series this Saturday with the possibility of additional competitors rolling into the pit area come raceday. A handful of former Evans Mills Speedway winners will be in the field including last year’s ‘Fall Brawl 50’ champion Dave Cliff with the Barbeau Racing No. 50, Barry Kingsley in the Lakeside Property Services No. 91, Bruce in the Woodchuck Saloon No. 22, and track owner Vern LaFave in his No. 97. Joining these four top contenders are several additional Oswego campaigners such as Anthony Losurdo in the brand new Missile Motorsports No. 1, James Babcock in the Team Jeannine No. 15, Cameron Black in the No. 23, Tim Proud in the Step One Creative No. 54, many-time Oswego feature winner Cameron Rowe in the No. 77, Brad Haynes in the No. 86, and Greg O’Connor, who was a breakout driver at the ‘Big O’ last season in the G.O. Premiere Motorsports No. 89. Returning competitors Dennis Richmond in the Addison Bowman Racing No. 12, David LaTulip in the Castiglia Lawncare No. 27 and Ron Pratt in the No. 88 will all join the fray in search of their first career victories at Evans Mills as well. In addition to these Small Block Super veterans, two rookies are also expected; Josh Sokolic and Steve Flack. Sokolic will pilot his family’s No. 26 Hedger Chassis, while Flack will pilot the former Alex McRae No. 14 recently purchased by G.O. Premiere Motorsports. It will mark Flack’s first career race, while Sokolic was in competition at Evans Mills last fall. With six of last year’s top ten finishers in Cliff, Bruce, Losurdo, Haynes, Proud, and Rowe all set to return for 30 action packed laps under the lights, it is anyone’s guess as to who will write their name into the history books and become the next Small Block Super driver to hold the checkered flag at Evans Mills Speedway. The time schedule for Saturday’s show will see pit gates open at 3:30pm, hot laps hitting the track at 4:30pm, and racing getting the green flag at 6:00pm. Joining the Small Block Supermodifieds on the race card are the Mills Modifieds, Legends, Bandoleros, 4-Cylinder Truck, and Sport Compact divisions. Pricing for fans and teams will be $10 general admission into the grandstands for adults, while all kids 15 and under are FREE. Active military members receive a $2 discount on grandstand admission while pit passes will be available for $30. 2018 Lighthouse Lanes SBS Series teams are reminded that the 2018-2019 Oswego Speedway rulebook will be enforced on the tour for all events with an exception being made regarding the tire rule for this Saturday. Teams may use any leftover Pathfinder Bank SBS legal tire from last year’s Oswego rulebook during the ‘May Meltdown’ event at Evans Mills, but following the series opener, all tires used on cars in the Lighthouse Lanes SBS Series must be the 2018-2019 10” 1057 compound. 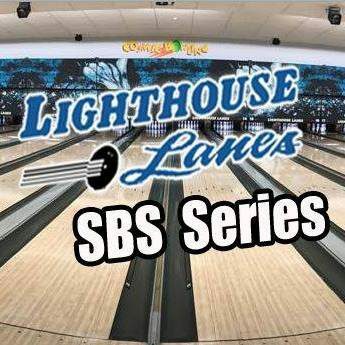 For more information on the Lighthouse Lanes SBS Series including a full schedule, roster, and more stats, be sure to visit online at LighthouseLanesSBSSeries.com. You can also FOLLOW on Twitter @LHLSBSupers or LIKE on Facebook at Facebook.com/LighthouseLanesSBS. About the Lighthouse Lanes SBS Series: The Lighthouse Lanes SBS Series is a northeast Small Block Supermodified touring club showcasing the stars and cars of Oswego Speedway’s Pathfinder Bank SBS division. Formed in the spring of 2017 by drivers Mike Bruce and Camden Proud in conjunction with Bob Hoefer at Lighthouse Lanes in Oswego, NY, the series is set to be a three race venture in 2018 and is made possible by the support of Lighthouse Lanes, Cam’s NY Pizzeria, Route 37 Building Supply as well as the dedicated team owners, drivers, and fans of Small Block Supermodified racing.